Very Northern Florida Cycling: November snow spotted! 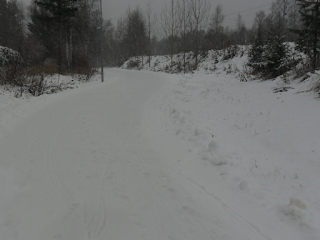 Snow, nice winter temperatures of maybe -10C. There was enough snow for the plowers to plow and get some piles on the sides. And kids were already sledding, of course. Then it rained water, eww! with the temperatures a little above freezing with some black ice thrown in to make cycling and walking more interesting. Same spot as above, I couldn't be bothered to cut this picture to exactly same view.